8 matches. 2 teams. 1 dream. It was a day of bittersweet victory for Raffles Ultimate. 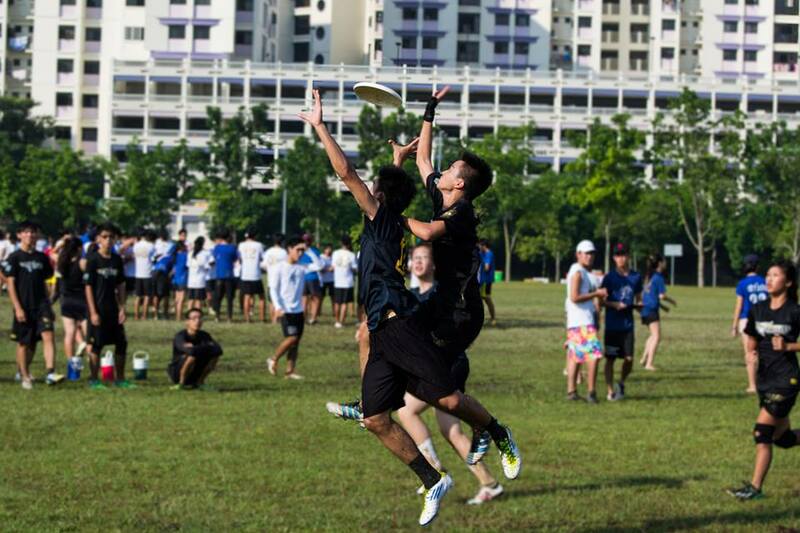 On the 8th of June, Raffles Ultimate fielded two teams for the Inter-JC Ultimate Championships 2013 at Cheng Lim Fields. From as early as 8am till as late as 6pm, teams from 10 junior colleges all over Singapore duked it out in a bevy of matches for the championship title. Having narrowly missed the championship title the previous year, the two teams fielded by RI were under immense pressure to reclaim the trophy for the school. This year, the games were played in a Swiss-Draw system, where each team had to play about 4 matches (each lasting 45 minutes) to decide their final placing. There would not be any final to decide the overall winner; rather, the winner would be the team that accrued the most points throughout its matches, based on the goal difference in the games that it played. Both teams started the day with impressive performances. Team B was the first to go up, dispatching Dunman High 7-2 with little difficulty. Team A followed up with an equally strong performance, dominating NUS High 11-0. The long months of practice before the competition had clearly paid off, as both teams made consistent, solid passes with few mistakes, if any. The two teams kept up their strong performance for the second round, with Team A dismantling River Valley High 8-1. 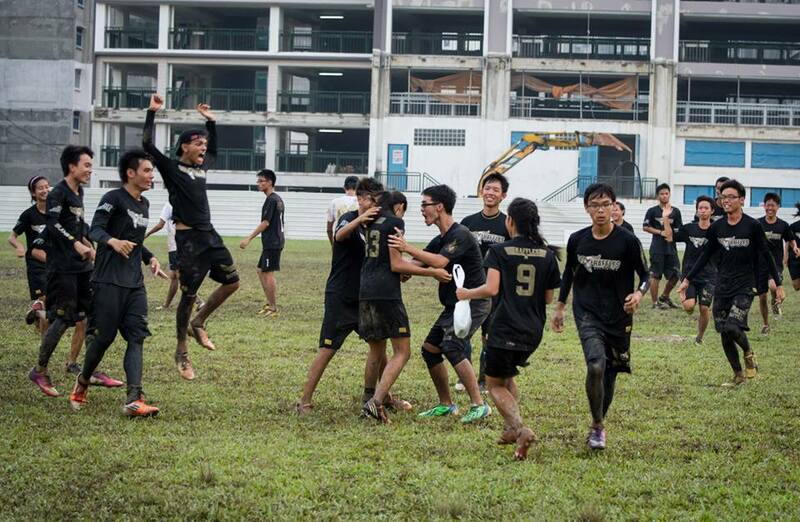 Team B, on the other hand, went down narrowly to Temasek Junior College in overtime, with a scoreline of 2-3. For the next match of the day, Raffles Team A faced off against perennial arch-rivals, ACS(I). With ACS(I) regarded as one of RI’s toughest competitors, the match was hailed by alumni and supporters alike as the most anticipated match of the day. Both teams got off to a strong start, fighting tooth and nail for every inch of the field. ACS(I) struck first, sneaking in a goal within the first few minutes of the match. Initially, the Raffles side appeared demoralized, but returned visibly reinvigorated after a pep talk from their coach Benjamin Ho. Subsequently, the team went on a devastating offensive, with Joy Wong scoring 3 points for the team in quick succession. The disparity in skill between Joy and her marker was painfully obvious, as Joy outran and outplayed her marker to score multiple times. The ACS(I) side fought hard to regain their footing, but each attempt was swiftly thwarted by a strong defensive showing from the Raffles team, their players effectively zoning the ACS(I) team inside their own endzone. Backed into a corner, the ACS(I) team fumbled the disc several times, leading to turnovers which accorded the RI side even more chances to score. As the ACS(I) side began to focus their defense more on Joy in an attempt to prevent her from scoring, the other Raffles players merrily exploited this gap in their defense, with Daryl throwing a quick flick out to Josh for RI’s 5th point of the match. As the match progressed, the ACS(I) side began to crumble under the withering offensive, conceding 4 more points. A well executed huck from the AC side allowed them to score a consolatory second point towards the middle of the match, but it was quickly becoming clear that RI already had the game in the bag. Throughout the match, the RI side appeared confident and at ease, making use of short, efficient passes to advance the disc up-field. In contrast, the ACS(I) side appeared flustered and frustrated due to the early goal deficit, making several frantic huck attempts which rarely connected with their receivers. This allowed Team A to take the match 9-2 amidst the raucous cheers of the Rafflesian crowd of supporters. Following their win against ACS(I), Raffles Team A went up against HCI in what would be their fourth and final match of the day. Staying calm and composed, our players made use of short, accurate passes to advance the disc in a slow, methodical offensive. Their patience was swiftly rewarded with a clean flick from Wern to Yi Jun for the first point of the match. Although HCI managed to score another point towards the middle of the match, they were unable to significantly impede the Raffles offensive. As a Y5 Raffles Ultimate player watching the match commented, the RI team seemed relaxed and at ease, with players barely breaking a sweat throughout the match. Ultimate frisbee is often lauded for its Spirit of the Game, where players are trusted to act as their own referees. This was on clear display throughout the match as RI players could be spotted calling out their own fouls, even when it meant putting the opponent team in a superior position. At one point when one of our players was about to contest a foul call, his teammate stopped him, explaining that it had indeed been a foul. Into the second half of the match, a Category 1 lightning alert was called, sending all matches to a halt. There was uncertainty for a period of time, as players had no idea what would happen to the matches that had been interrupted. In a rather anti-climatic moment, Team A was eventually declared the match winners due to their scoreline of 5-2 over HCI. Due to the Swiss-draw style system of play, this meant that they had the most points among all the teams present, and they were hence declared overall winners. Although Team A had already secured the championship title, Team B still had one more match to go. Over at the other end of the field, the day was not going as planned for Raffles Team B. Earlier that day, they had just lost 3-4 to River Valley High due to the universe point, and now they were up against Pioneer Junior College to determine their final placing. Unfortunately for the gryphons, the match did not begin well. The RI defence appeared shaky and uncoordinated, with key opponent players left unmarked. PJC was quick to exploit this, scoring 3 clean goals in the first half of the match. As the match began to look increasingly grim for our young gryphons, the RI Team B coaches Ervin and Wei Zhong called for a timeout. Their words had an appreciable effect on the team’s play; the players returned to the match with renewed focus, powering the disc through the field in a very aggressive style of play. While not the cleanest of tactics, it still worked, as Jeremiah managed to fend off two defenders in the endzone to catch the disc. Our team’s first goal heralded a significant shift in momentum towards our side, as the players began to fight with renewed spirit and determination. The game was not without controversy, however, as a foul was called on Si Kai just as he threw a quick backhand to Jue Ying for a goal. 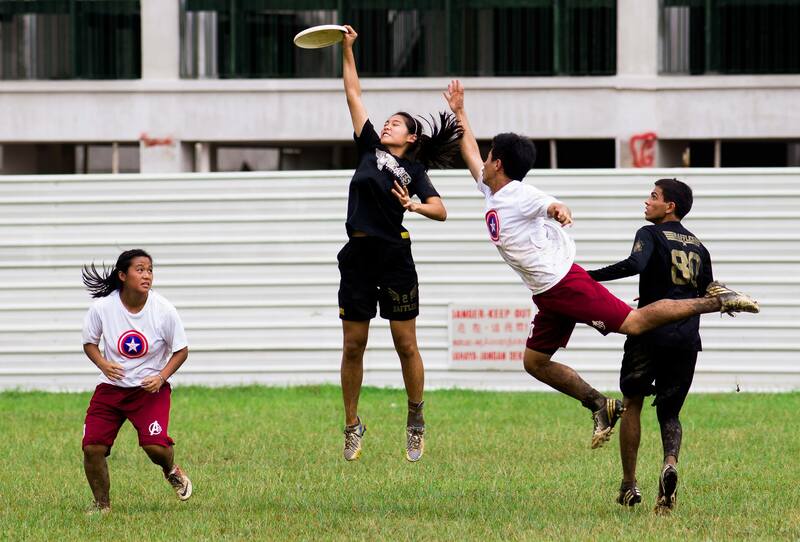 Though the disc was eventually sent back, Jue Ying quickly caught the disc once again to score the second point for the team. Minutes later, Sabrina Chan made a short pass to Jeremiah Choo in the endzone, levelling the score to a 3-3 tie. As the clock ticked down to the end of the match, a stalemate ensued, with neither team able to score the crucial last point. As the match ran into overtime, the universe point was put into play – whichever team scored the next point would essentially win the match. Despite their consistent performance thus far, the Raffles side was visibly exhausted by this point. At times, the players fumbled what appeared to be easy catches, struggling to keep up with their opponents. This was only intensified by the state of the field; players were drenched in mud, frequently slipping in the waterlogged grass. The next few minutes were nail-bitingly tense as the disc went back and forth. Neither team seemed to have a significant advantage, and supporters on both sides fell silent in a mixture of apprehension and worry. Both teams were desperate to score – at one point four players from both sides collided in a headlong rush for the disc. But ultimately, their magical comeback was not to be. A clean huck from PJC, coupled with a layout catch from the receiver scored the final point for their team. A hush fell over the sidelines, as supporters ran onto the field to console the team. 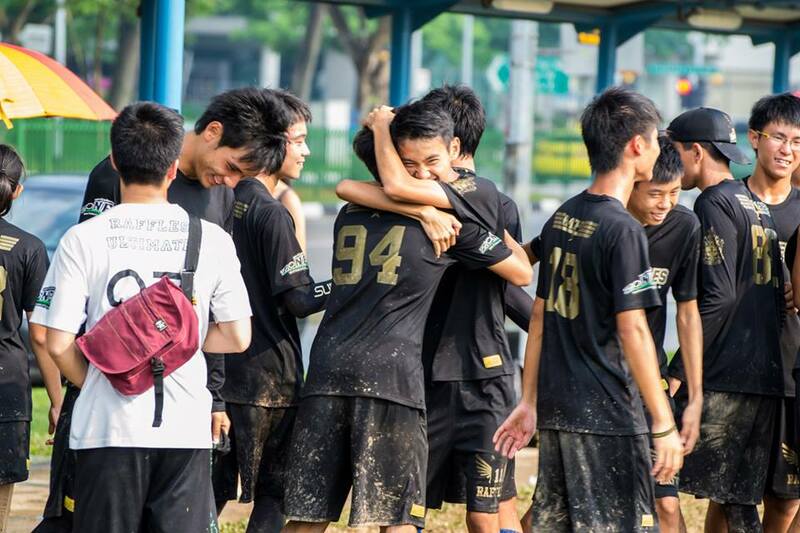 When asked about Team A’s remarkable achievement, Team A’s coach Benjamin Ho had this to say, “Last year, the team was quite disappointed with the loss – both teams went out in the semi-finals with universal points. 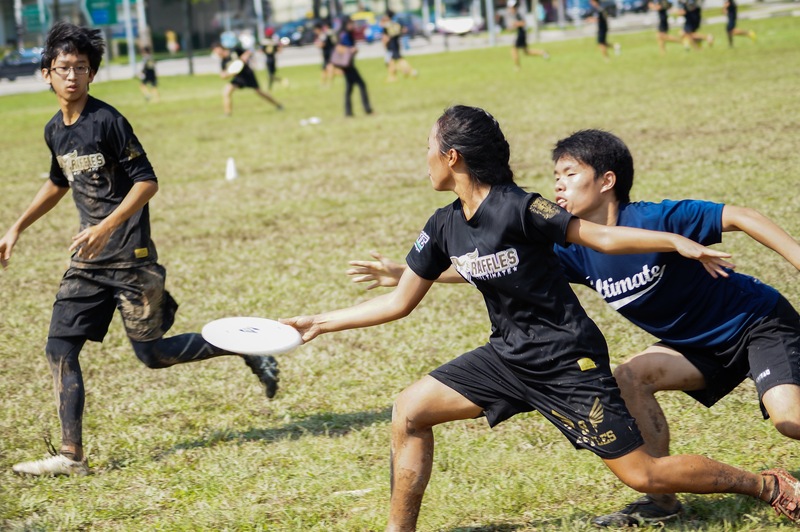 This year, we let the team train hard and they came back to where Raffles Ultimate is supposed to be.” Raffles Press would like to congratulate the team on their fine display of tenacity and teamwork. If today’s showing was anything to go by, we have full confidence that Raffles Ultimate will have no trouble re-taking the title next year.